Recommended to: Readers who enjoy books with vivid characters dealing with tough issues. On the surface, sixteen-year-old Lesley Holloway is just another bright new student at Hawthorn Hill, a posh all-girls'; prep school north of London. Little do her classmates know that she recently ran away from home, where her father had spent years sexually abusing her. Nor does anyone know that she's secretly cutting herself as a coping mechanism...until the day she goes too far and ends up in the hospital. Lesley spends the next two years in and out of psychiatric facilities, where she overcomes her traumatic memories and finds the support of a surrogate family. Eventually completing university and earning her degree, she is a social services success story&#8212;until she becomes unexpectedly pregnant in her early twenties. Despite the overwhelming odds she has overcome, the same team that saved her as an adolescent will now question whether Lesley is fit to be a mother. And so she embarks upon her biggest battle yet: the fight for her unborn daughter. Etched on Me deserves a round of applause. Honestly, it does. It deals with situations that most of us shy away from talking about, but it does it in a blindly honest and raw way. Things like childhood sexual abuse, depression, self-destructive behaviors, and just plain loneliness are all touched on. Lesley Holloway's story may be fiction, but the book speaks to those who know these feelings are real. Jenn Crowell shows that traumas like these have both the power to break us down, and to push us into the arms of the people we need to build us back up. It shows the reality of the long, hard climb back into the light. In terms of the fictional side of it all, Lesley was a brilliantly written character. Sexually abused from a young age, we meet her as she has finally had the courage to escape from her abuser, and find the help she needs. What I loved about Lesley was how realistic her character felt. She isn't perfect. She's petty, jealous, loving, confused, hate-filled, and every other emotion there is out there. I eagerly followed her journey as she fought to make a life she could believe in. I cried with her, laughed with her, and felt all the bumps along the road as if I were her. Jenn Crowell has written one amazing character in Etched on Me. In fact, that's what I loved about this whole story. The raw, gritty feel that it has to it. Lesley's recovery is brutal. It's filled with people who both lift her up, and dash her back down to the ground. She makes mistakes, stumbles and falls, yet still manages to pick herself back up. Everything about her journey made me feel like I was right there with her. This story shows us how much strength we all possess inside us. It reminds us that hope is out there. That help can be sought if you know where to look. That no one is perfect, but we can damn sure try to be our best selves. That fighting your way out of the darkness isn't easy. 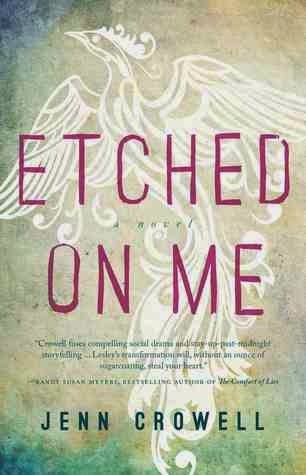 I'm so glad I agreed to read Etched on Me. While I haven't had to deal with anything of this magnitude in my own life, I had no problem feeling everything Lesley felt. I honestly feel that Crowell's book has the power to change lives. To remind those out there who might be silently dealing with abuse, self-harm, or anything of that nature, that there is a voice for us all. Even if it's one told through fiction. Huge applause for this book. Highly recommended.